Members of the Toadsuck Dulcimer Club: Diane Johnson (front, from left), Kay Millan, Larry Rains, Bob Banuken, Andrew Gillespie; Peggy Pillow (middle), Karen Clay, Sandra Barnett, Beverly Sperry, Ann Owens, Morris Troglin; Bill Day (back), Don Johnson, Bruce Dacus, Bill Smith and JR Barnett. In the summer of 2011, I found myself in Clemmer Dulcimer Shop in Tennessee, where the store owner talked me into purchasing a dulcimer by saying, “Learning to play a dulcimer is as easy as counting to 10.” I already had numerous failed attempts with other musical instruments. But, after a few minutes with the dulcimer, I found myself able to play a few simple tunes. And that is where my journey began. I traveled back to Arkansas, where I taught myself to play some actual songs. I was intrigued to discover a dulcimer club in Little Rock. I soon realized that learning to play an instrument with other people is not only easier, but a lot more fun. I could hardly wait for the second Saturday of every month, the only time the Little Rock club met. That’s when I decided to find a place for local dulcimer players to meet more often. I asked my pastor, Neal Winstead of Family Life Bible Church, if I could use the church as a meeting location for those interested in joining a local dulcimer club. I was thrilled when he gave me permission and even offered to let me advertise it in the church bulletin. 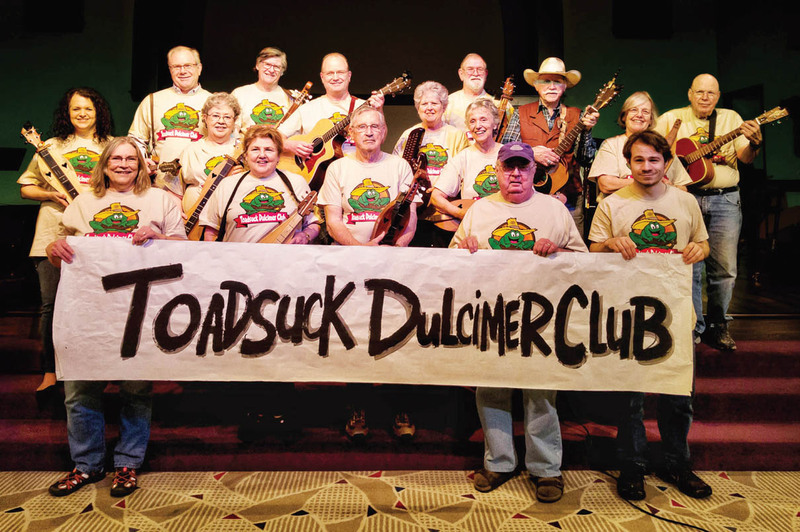 In February 2015, the Toadsuck Dulcimer Club began with only three church members. Since then, the group has grown into a group of about 18 members, with some church members. As the Toadsuck Dulcimer Club, we’re not only a group that meets every Monday night for the sole purpose of furthering our passion of the dulcimer, we are also friends. We are very accepting of each other and encourage one another through all that we do. Participation in the club is completely free and open to the public. The club is not limited to just dulcimers. We accept all sorts of stringed instruments to play alongside us. We currently have guitar, mandolin, accordion, hammered dulcimer and mountain lap dulcimer players. The ages of our players range from 12 to 80. For anyone interested in joining the Toadsuck Dulcimer Club, contact Peggy Pillow at peggypillow@hotmail.com.